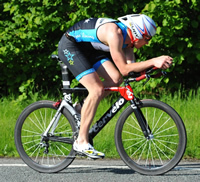 Favourite Race: I should really say duathlon, but anything long distance where the swim has less impact. Triathlon Goals: To look as classy as Faris wearing speedo’s and a mullet. Despite having flipper sized feet, these are more of an anchor for me in the water and my race really begins after T1. As a runner since childhood this is a well developed strength, however my bike is rapidly taking over as a weapon. A recent advocate to barefoot running and reaping the benefits; including less kit to wash and enjoying the abuse from the local park “yoof”. My racing philosophy is that if you don’t collapse at the finish line you haven’t raced hard enough. Go Hard or Go Home.